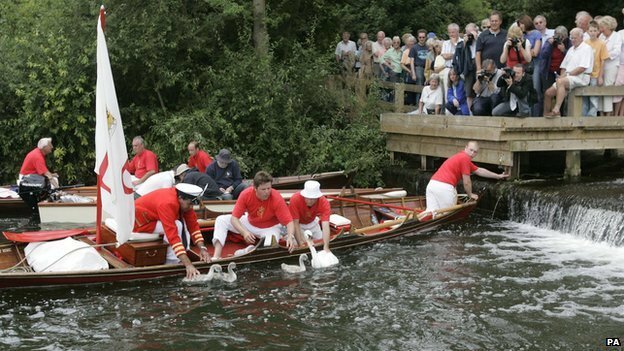 Swan Upping, the ancient British tradition of counting swans along Thames River, has begun on July 15. The ritual known as Swan Upping dates back to the 12th century when the ownership of all unmarked mute swans in open water in Britain was claimed by the Crown in order to ensure a ready supply for feasts. On the River Thames a team of boatmen called Swan Uppers have the job of corralling, catching and marking the birds on the water between Sunbury-on-Thames in Surrey and Abingdon in Oxfordshire this week. When a brood of cygnets is sighted, a cry of ”All up” is made to signal that the boats should get into position. The swans – usually two parent birds and three cygnets – are then weighed, ringed and checked for signs of disease or injury. David Barber, the Queen’s Swan Marker, said ahead of the start of Swan Upping that despite the recent problems faced by nesting birds things appeared to be improving. He said: “The Thames’ swans are nesting later than usual due to the prolonged cold spring we have experienced this year. The number of cygnets has declined over recent years, primarily due to the spring floods that washed away many nests, and of course there have been several outbreaks of duck virus enteritis which killed many breeding pairs of swans. “Fortunately, the situation is looking more positive this year as we have received many reports of nesting pairs with eggs or cygnets.